​Attached are the Annual Meeting Minutes for the V-8 Registry Chapter meeting held on July 25th, 2018 in Pittsburgh. Although a number of our members did not arrive until Thursday, attendance by our members was approximately thirty-four. In addition, twelve of those members brought their V-8 conversions to the convention. Our records indicate that this is a record number attending an Annual Meeting. Our International membership stands at 180 members, another all time high for our Chapter. This year's convention was a well done event by the Pittsburgh CORSA Chapter. The weather cooperated and the comradery was evident. Thanks to CORSA for helping to make it special. The Annual Meeting of the V-8 Registry was held during the CORSA International Convention in Pittsburgh, PA. The meeting was held at the home of John and Claudia Black on Wednesday, July 25, 2018. At 8:05 PM, Chairman John Lanning called the meeting to order. Twenty-one members and five guests were in attendance based on the sign-in sheet. No CORSA officers or Directors were present. The Chairman introduced Paul Beck, the Treasurer and Russ Brandenburg, the group's Founder and Past-President. Minutes from the 2017 meeting were posted on the Registry website and were approved without corrections. Paul Beck, the Treasurer, submitted a Financial Statement for the previous 12 months ending July 1, 2018. A total balance in the bank account of $3,177.93 was reported by Mr. Beck. Copies were made available and the report was approved. A copy of the report will be submitted for viewing on the Registry website. The Chairman reported on the C5 Project Group and introduced Bob Depalo. Bob owns a machine shop and car building business in Hot Springs, AR. He is using the donor car provide by Mark Allen to install a C5 differential adapted to a BC Saginaw 4-speed and mated to a Chevy LS375/525 crate engine. Bob introduced himself and provided information on his experience and plans to turn Mark's car into a contender for road racing. Bob indicates that this build should only take a couple of months. Keith Waters, another member who is also a machinists is working on a similar C5 project car and will share his CAD drawings and dimensions with other members wanting to add a C5 differential to their cars. Bob has offered to do the same, but also plans to offer a kit or a running chassis. John reported that the black t-shirts for 2018 have been mailed. He reported that gray shirts are available as a convention special for $20. Registry Magnetic signs are also available for $20. The shirt for 2019 has not been discussed, but suggestions are welcomed from the membership. The Chairman reported that the I D Tag Project was completed since last year's annual meeting. This idea was initially proposed by Mike Levine in 2015. Thanks to the help of Mark Allen's friend, we were able to have the tags produced at a reasonable cost. All members who requested an I D Tag have received them if their conversions are at least 80% completed. Tags were issued only to members supplying a VIN and at least one picture. Tags are still available to members. To date, 140 tags have been issued. John reported again this year that no action has been taken on writing by-laws for our group. It was proposed in 2016 that a method for election of Registry officers be submitted. In the meantime, the current officers have agreed to continue in their listed positions and the members unanimously voted to continue with the same officers. 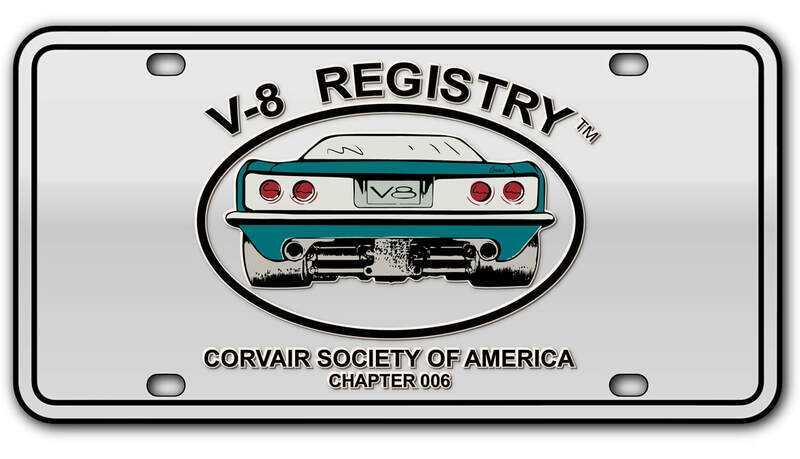 A new V-8 Registry banner was made and will be displayed at conventions and meets. Unfortunately the hotel would not allow any banners to be displayed at this year's convention. There are no scheduled racing events planned for Registry members during the balance of 2018. Members were encouraged to participate at regional track events and display their shirts and signs. The North East Corvair Council (NECC) sponsors a number of track events annually and members were encouraged to support NECC activities. Several members indicated that they plan to attend the track event in Hastings, Nebraska. This event is hosted by Chris Shade in late August. The Ted Trevor Award judging committee met during the convention to determine whose car most closely matches the criteria for an original Crown car. The trophy for 2018 goes to Howard Trevor. Howard won the award with his yellow 65 Monza Crown coupe that was originally built by his father, Ted Trevor. He received a personal plaque and the perpetual Ted Trevor Trophy will remain with Howard until next year. The People’s Choice Award for 2018 goes to John Black. His 66 Monza '427' coupe was a big hit in the autocross. John was awarded a personal plaque during our meeting. Rich Deiter's suggestion that members offer new members a 'Ride Along' received a favorable review. Many new members have never driven a conversion. If a new member asks about another member's car, you are encouraged to offer them a ride or even a drive. This offer will help new members make better choices when buying a conversion. Members were encouraged to sit in Paul Beck's conversion and try out his new electric power steering. It's quite impressive and reasonably priced. Paul indicates that some minor fabrication and cutting is required, but very doable. With no further business to transact, door prizes were drawn and the meeting adjourned at 8:55PM. Minutes of the meeting will be submitted to CORSA. Following the meeting, a tutorial was presented by the Chairman on how to use the Registry's Forum. The presentation was well received and many questions were answered.